Detecting Internet outages world-wide and in real-time is no small feat. It requires distributed measurement infrastructure, tools and processing power to analyze the resulting data, plenty of storage to save it, and a powerful user interface to visualize the data. IODA (short for Internet Outage Detection and Analysis) is CAIDA’s solution to this problem. In an attempt to make IODA more useful, we just launched @caida_ioda, a Twitter account to bring attention to select Internet outages. 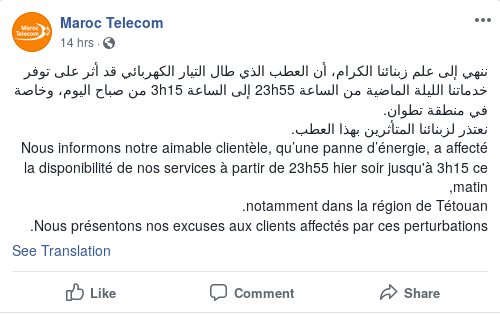 We inaugurated this account by revealing an outage that took place in Morocco, on July 19, from 11:30 pm to 3:50 am local time. The visualization below illustrates this outage. 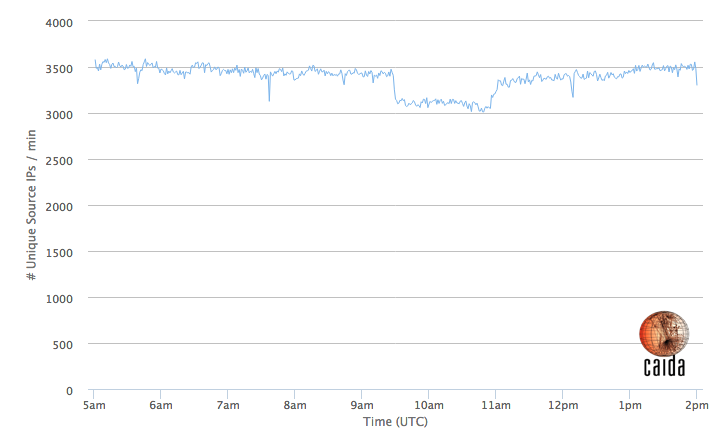 The blue time series represents our active probing data. 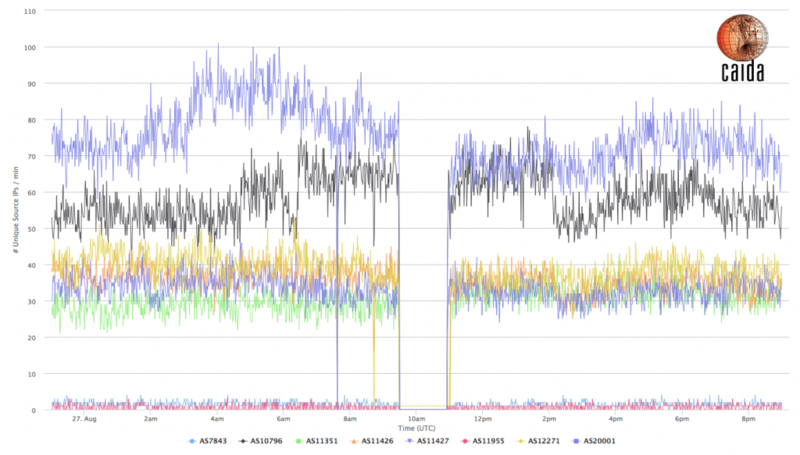 This data comes from a cluster of twenty software instances, located at SDSC in San Diego, that repeatedly ping active hosts in the IPv4 address space. Each data point of the time series captures the normalized number of /24 network blocks in Morocco that responded to these pings. The data is normalized with respect to the maximum value observed in the inspected time interval. Starting at 10:20 pm UTC, this fraction dropped significantly (from ~19,700 /24 network blocks to as low as ~13,400) and slowly started to recover after a few hours. The green time series exhibits a drop at the same time—it represents the normalized number of /24 network blocks that are reachable according to BGP, and geolocated to Morocco. The gaps in the BGP time series are due to missing data points caused by temporary issues with our infrastructure. You can use our interactive dashboard to investigate this outage yourself. Internet outages do not always affect entire countries; their scope is frequently limited to regions or autonomous systems (ASes). IODA can detect such sub-national outages and, coming back to our example, did so for Morocco. The map below suggests that not all of the country’s regions were affected equally. Note, however, that IP address geolocation (that is, the mapping from IP address to geographical location) is far from perfect, so take this information with a grain of salt. IODA determines an anomaly score for each outage that it detects. Our help page provides more details on how we determine this score but in essence it’s a number that captures the severity of the outage. A look at IODA’s AS-level breakdown confirms that Maroc Telecom was affected the most—the ISP’s overall anomaly score is more than twice that of Itissalat Al-Maghrib, the ISP that ranked second. 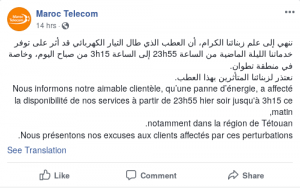 The time span quoted by Maroc Telecom roughly confirms what IODA saw but our data suggests that the outage began earlier—our active probers first saw a decline in connectivity at 11:30 pm—about half an hour before the alleged start of the outage. We are supporting public access to IODA’s dashboard for exploration of this and other outages; please use it and send feedback to ioda-info AT caida DOT org. 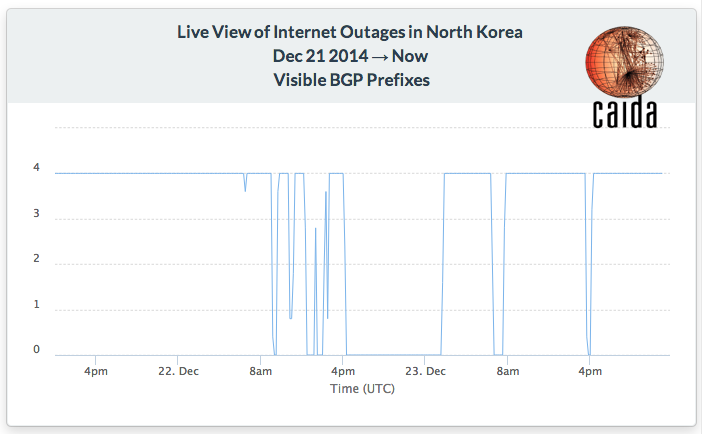 As reported by Dyn Research, North Korea has experienced extremely unstable Internet connectivity in the last few days. We offer a near real-time (30-minute delayed) view of the BGP-visibility of the 4 IPv4 prefixes announced by STAR-KP, Ryugyong-dong (North Korea’s national telecommunications provider). This real-time view represents a sneak peek of the intended outcomes of our Internet outage detection and analysis project. On Wednesday 1 October 2014, CAIDA hosted a small invitation only workshop that brought together researchers working on large-scale Internet outage detection and characterization with researchers from the political sciences with specific expertise in Internet censorship, political violence (including Internet connectivity disruption ordered by authoritarian regimes for censorship), and Internet penetration. Participants viewed and demonstration of and discussed CAIDA’s current data analysis platform for the exploration of historical and realtime Internet measurement data (named “Charthouse”), and possible extensions of the platform to support political science research related to macroscopic Internet outages. 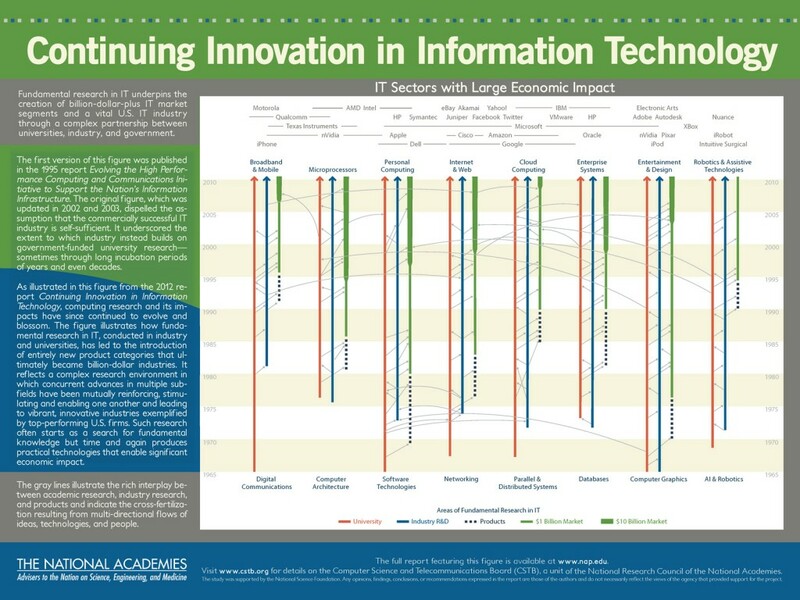 The workshop also included experts from the San Diego Supercomputer Center’s Data Enabled Scientific Computing Group, who provided valuable insights into methods for scalable analysis of large data sets requiring high performance computing platforms. We currently plan to implement part of the Charthouse platform using the Spark/Shark data analytics stack. In the early hours of August 27th 2014, Time Warner Cable (TWC) suffered a major Internet outage, which started around 9:30am and lasted until 11:00am UTC (4:30am-6:00am EST). According to Time Warner, this disconnect was caused by an issue with its Internet backbone during a routine network maintenance procedure. A few sources have documented the outage based on BGP and/or active measurements, including Renesys and RIPE NCC. Here we present a view from passive traffic measurement, specifically from the UCSD Network Telescope, which continuously listens for Internet Background Radiation (IBR) traffic. IBR is a constantly changing mix of traffic caused by benign misconfigurations, bugs, malicious activity, scanning, responses to spoofed traffic (backscatter), etc. In order to extract a signal usable for our inferences, we count the number of unique source IP addresses (in IBR observed from a certain AS or geographical area) that pass a series of filters. Our filters try to remove (i) spoofed traffic, (ii) backscatter, and (iii) ports/protocols that generate significant noise. Most of TWC’s Autonomous Systems seem to have been affected during the time of the reported outage. Our indicators from the telescope show a total absence of traffic from TWC’s ASes, indicating a complete network outage. Figure 1 shows the number of unique source IPs originated by TWC ASes per minute, as observed by the network telescope; we plot only TWC ASes from which there was any IBR traffic observed just before and after the event. For reference, these ASes are: AS7843, AS10796, AS11351, AS11426, AS11427, AS11955, AS12271 and AS20001. 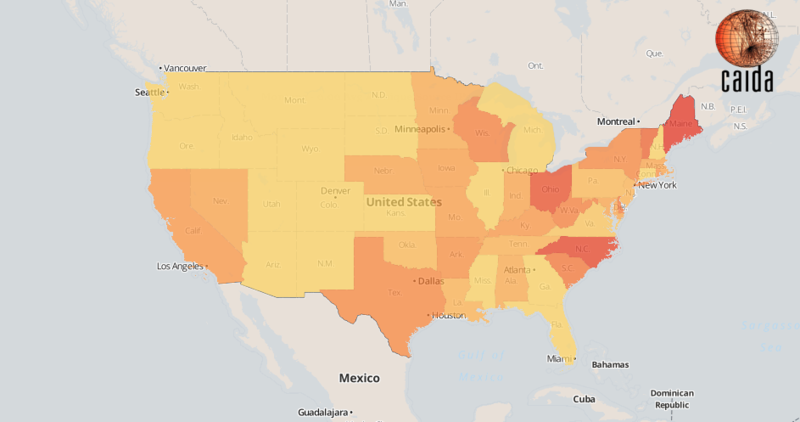 TWC is a large Internet access provider in the United States, and this IBR signal can also reveal insight into the impact of this outage across the country. Figure 2 shows the same metric as Figure 1, but for source IPs across the entire country, indicating a drop of about 12% in the number of (filtered) IBR sources, which suggests that during the incident, a significant fraction of the US population lost Internet access. Drilling down to a regional level shows which US states seem to have suffered a larger relative drop in traffic. Figure 3 compares the number of IBR sources observed in the 5 minute-interval just before the incident (9:25-9:30UTC) to the 5-minute interval after it (9:30-9:35UTC). The yellow to red color gradient represents the ratio at which a certain state’s IBR sources have decreased (redder means larger drop). States that did not suffer a substantial relative decrease are shown in yellow. This geographical spread is likely correlated with market penetration of TWC connectivity within each state. On the 29th of November, shortly after 10am UTC (12pm Damascus time), the Syrian state telecom (AS29386) withdrew the majority of BGP routes to Syrian networks (see reports from Renesys, Arbor, CloudFlare, BGPmon). Five prefixes allocated to Syrian organizations remained reachable for another several hours, served by Tata Communications. By midnight UTC on the 29th, as reported by BGPmon, these five prefixes had also been withdrawn from the global routing table, completing the disconnection of Syria from the rest of the Internet. You are currently browsing the archives for the Internet Outages category.